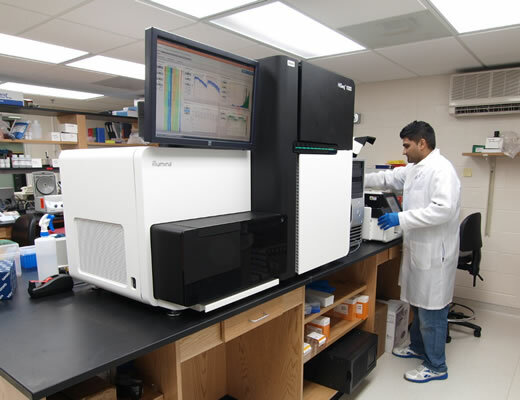 The Yerkes National Primate Research Center Nonhuman Primate Genomics Core (GenCore) provides researchers in the Emory community access to cutting-edge, high throughput genomic technologies, including Illumina Next Generation sequencing and microarray, and support for bioinformatics and analysis of genomic data. The Yerkes National Primate Research Center, Emory University, has received a four-year, $3.3 million grant from the National Institutes of Health to study HIV infection at the level of the genome. The goal of this new genomics project is to identify the genes responsible for causing disease in humans and those that are protective in African species of monkeys that are AIDS-resistant. HIV and its monkey counterpart, Simian Immunodeficiency Virus (SIV), leads to AIDS-like disease in infected people and rhesus macaques. However, some African species of monkeys, such as the sooty mangabey and African green monkey, remain disease-free even when infected with virtually identical strains of the SIV virus. "Our study will measure thousands of genes that are turned off and on, referred to as the transcriptome, in patients and animals that get disease, and people who are receiving HIV-medication, and compare them to species that are AIDS-resistant," says Guido Silvestri, MD, who will lead the research team. Silvestri is Yerkes Division Chief of Microbiology and Immunology, and the team includes researchers from Yerkes, the University of Pittsburgh and the University of Washington. The human genome contains approximately 20,000 genes, and the research team will use Next Generation Sequencing technology to sequence more than 2,000 transcriptomes. Doing so will define extent of genes expressed in multiple classes of immune cells (e.g., CD4 T cells, CD8 T cells and B cells) that are targeted by the virus and responsible for the immune response during HIV infection. "We hope to find differences in gene regulation between models of infection that develop AIDS compared to those that are resistant to disease," says Steven Bosinger, co-director of the Yerkes Nonhuman Primate Genomics Core Laboratory and a co-investigator on the study. "We also hope to uncover genes driving disease in HIV-infected patients on medication," Bosinger says. "Current HIV medications suppress the virus, but don’t treat the residual inflammation that causes disease. Studying multiple species helps narrow down which genes are responsible for the disease process, rather than simply being different due to interspecies variation. With this information, we want to identify potential targets for developing therapy to treat residual HIV disease directly." The mission of the Yerkes National Primate Research Center Nonhuman Primate Genomics Core (GenCore) is to provide researchers in the Emory community with access to cutting-edge, high-throughput genomic technologies, including Illumina Next Generation sequencing and microarray, and to provide support for bioinformatics and analysis of genomic data. Projects in the GenCore laboratory include transriptomic profiling of several pre-clinical vaccine candidates, expression monitoring of clinical trials samples undergoing novel anti-HIV therapies and RNAseq in humans and several NHP species. Within the fields of microbiology and immunology, neurologic diseases, neuropharmacology, behavioral, cognitive and developmental neuroscience, and psychiatric disorders, the center's research programs are seeking ways to: develop vaccines for infectious and noninfectious diseases; treat drug addiction; interpret brain activity through imaging; increase understanding of progressive illnesses such as Alzheimer’s and Parkinson’s diseases; unlock the secrets of memory; determine how the interaction between genetics and society shape who we are; and advance knowledge about the evolutionary links between biology and behavior.